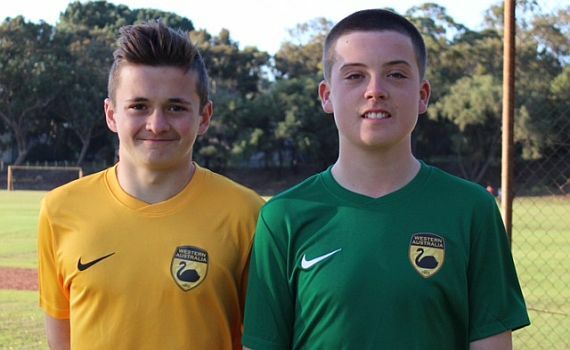 After a season of success ECU Joondalup duo George Jackson and Ciaran Bramwell have been selected in the WA State under 14’s squad to play in the National’s at Coffs Harbour next week. The Jacks under 14’s won the top five Cup, with both Jackson and Bramwell performing well for Willie Herd’s side. Bramwell started playing at Quinns FC from U6-U10 before joining ECU 6 years ago. One of his biggest highlights was receiving an opportunity to train at Crystal Palace, West Bromwich Albion and Aston Villa academies with their U13 players when he was 12 and being invited back to train at WBA between my 15th and 16th birthday. Jackson started his football at Wembley Downs SC when he was 6 years old, and played as an outfield player until he was 11, then he started filling in for goalkeeper and started to enjoy it, and has played in goals ever since. So far he has had 3 years at ECU and has really enjoyed his time here. The highlight of his time at the club was the Top four cup final against Sorrento this year, when he saved two penalties in the shoot-out, the Jacks ended up winning. From everyone at the club good luck boys!!!!! !